They say some of the best things in life are the simplest, you would certainly think that when you look at Ornate Gardens new Wheel Bench. The design was achieved over the winter of 2013 when you would normally be resting from a hard summer of selling garden buildings. Not OG, they decided to dissect their garden pods to see what else could be achieved from this unique design. By mounting two pressure treated laminated timber circles opposite each other we have created a cylinder. An 800mm x 1200mm table was then fixed into the centre of the cylinder with two wooden seating sections either side. This leaves you with ample room for six people to be seated within. This cylinder Wheel Bench has been assembled using their signature parts of stainless steel, polycarbonate and timber. Help your garden discover a new world with the Rotating Seater, a contemporary garden building design with British high quality craftsmanship. Relax and enjoy the views from your garden without the chill of those spring or autumn breezes. 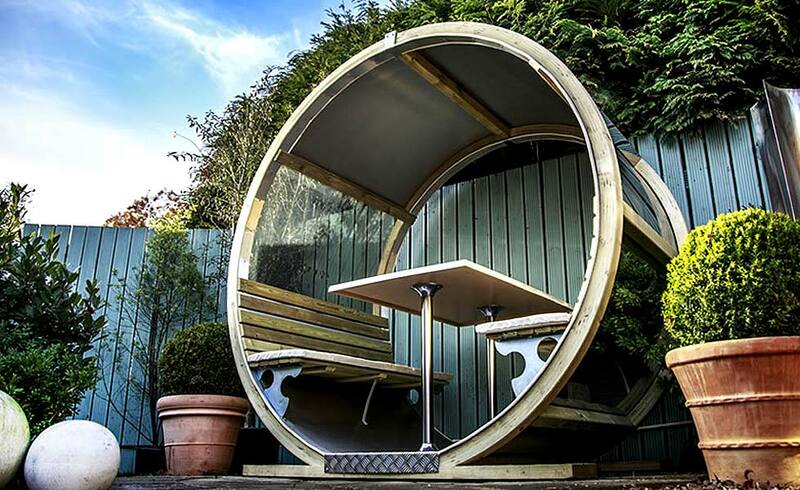 Take the indoors outdoors… The ultimate way to enjoy your garden enviroment all year round! Proud to exhibit at the Homebuilding & Renovating Shows. OrnateGarden creates and sells objects of style and beauty which are both timeless and contemporary. 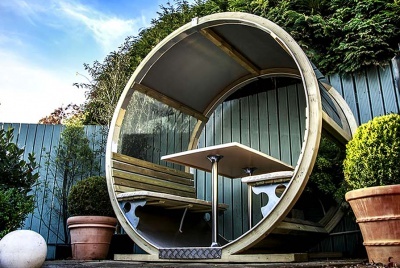 The collection consists of garden pods, rotating spheres, garden furniture, lighting and accessories for outside living, the emphasis being on the use of very high quality materials and flawless British craftsmanship.